An organization like the Friends can’t survive without the help of its members. A good way to begin helping the group, and through it the library, is volunteering at book sales and/or Logos Books. You’ll get to know other Friends and learn about other ways you can help. 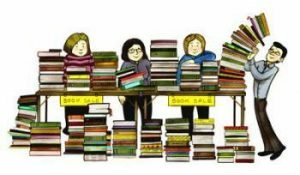 If you would like to volunteer for the book sales, contact Gary Godefroy, Book Sale Coordinator, who would be happy to hear from you. Click his name to send email or telephone 530.400.3610. To volunteer at Logos Books, please email LogosUsedBooks@gmail.com. Our Volunteer Coordinator, Jeff Lee, can explain other volunteer opportunities. For more information, email volunteers@davislibraryfriends.org or call 530.302.5580. The Friends of the Davis Public Library needs a new friend to help much-loved books get back on the shelves. This dedicated, long-standing group works diligently at the library every Tuesday from 9-3, with a break for lunch. We are seeking a reliable person who appreciates meticulous work and attention to detail. An extensive training period will be offered to ensure a good fit all around. Please consider your skills and interest, and think about volunteering. For more information about the book mender position, contact Antoinette Heberlein by clicking on her name or calling 530.758.1359.